Marty O'Brien was lucky to escape a close encounter with a huge saltwater crocodile. FISHING is a favourite recreation for many truckies around Oz when they get downtime, but there are also some very important rules to be followed to make it safe. Especially for drivers from north Queensland, the Northern Territory and parts of Western Australia who have favourite creeks or rivers - often secret spots - that are habitats for saltwater crocodiles. Only the watchful eye of Marty O'Brien and his mates prevented them from becoming a potential meal for a saltwater crocodile. Marty and some friends were stalked by a big reptile in shallow water just off the beach near Umagico on the northern peninsula area of Far North Queensland. Marty is a member of a gang of four that work for a Townsville company and they travel around in an Isuzu Sitec 200. The 42-year-old Marty told of his encounter with the reptile after returning from a fishing trip with mates. "It was on April 15 when we noticed the croc swimming near us," he said. "I estimate it was about 3.5m long and we kept a good eye on it before leaving. I think it was looking for fish guts which had been left by others before and we didn't want to end up as its meal." While Marty never felt the croc was going to attack, he was extremely wary being in an area where crocodiles lived. "I kept my eyes glued on the croc," he said. Since early in the new year Marty has worked at Bamaga, Thursday Island and Badu Island. He relayed other information he has heard about reptiles in the region. "There is a big croc which hangs around near the jetty at Seisia, which everybody seems to know about," he said. "But there are lots of big crocs up here so you have to be careful as it is their habitat." LUCKY ESCAPE: Marty kept his eyes glued on the monster salty on a recent fishing trip. Marty was talking about his encounter with the reptile when back in Townsville at the Riverview Tavern and was showing other patrons a video of the incident on his mobile phone. "Whilst I was up there I often went fishing and caught sweetlip, mangrove jack and plenty of queenies," he said. Quietly spoken, Marty said he was overcome by the friendly people he met on the Torres Strait Islands and NPA. "We worked on eight new driveways on Badu and did various jobs on TI and the NPA at Bamaga and Umagico," he said. Marty said he enjoyed having time off at the Torres and Federal Hotels on TI and the one on Badu near the football oval. "I want to get up there for the Island of Origin rugby league carnival this year," he said. Born at Winton in the Queensland outback, Marty used to play rugby league for Wanderers Club in Mount Isa. Winton is 600km from Townsville via Hughenden. "I will be going back to the Torres Strait and NPA soon for work and am looking forward to it," he said. 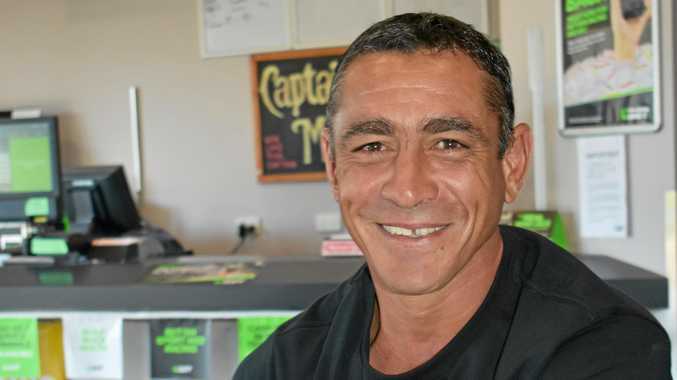 Former Tasmanian truck driver Aaron Smith is the editor of the Thursday Island based Torres News newspaper, which distributes to the Torres Strait Islands and the NPA. Aaron holds a medium rigid licence and hails from Tasmania, where he worked as a handyman, and has been an owner-operator across Bass Strait in Melbourne. His Melbourne business was called Mr Move and he had a seven-tonne Hino that transported furniture. He moved to TI five years ago. 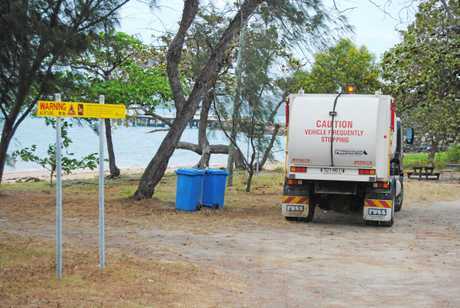 Warning signs are everywhere for truckies in tropical Queensland. Like many who live in the Torres Strait, Aaron has an outboard motor-powered dinghy, in which he regularly goes fishing. In the Torres Strait these boats are affectionately known as "Kingswoods". Aaron said Marty and his friends had been spot-on to exercise extreme caution when they saw the crocodile. "Crocs are always on the back of your mind, especially as we have had a couple of sightings close to home in recent weeks, one around 4m that has been hanging around at the community boat ramp on Thursday Island, unfazed by the boats coming and going, and another just this week, a bigger monster was right off the beach in front of my house where the kids swim," Aaron said. "Their number definitely seems to be on the rise in the region." 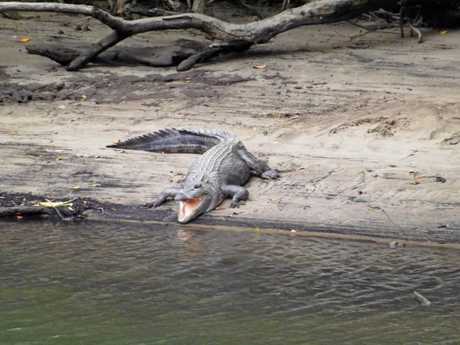 The Queensland Department of Environment and Heritage warns that crocodiles may be found in all North Queensland waterways, even if there are no warning signs. "Warning signs are only placed in areas where crocodiles are known to frequent," the department said. "Ignoring signs that are there to protect you puts your life at risk. But note that just because there are no signs does not mean there are no crocodiles. Just because you can't see a crocodile doesn't mean there is not one close by. Crocodiles can be very patient and can stay underwater and unseen for up to four hours. "Watch out for crocodiles in unusual places after very high tides and heavy rains. Crocodiles can move further upstream during very high tides and periods of flooding and may move into new areas where crocodiles had not been seen before. Camp at least 2m above the high water mark and at least 50m from the water's edge. Crocodiles have attacked people in tents pitched too close to the water. Dogs are attractive prey to crocodiles. Keep your pets on a lead and away from the water's edge. "Don't leave food, fish scraps or bait near the water, around your camp site or at a boat ramp. Crocodiles will be attracted by an easy meal."